Ever heard of a male pageant that produces a winner with a unique combination of A fit body tone and an entrepreneurial mind ? Welcome to the world of the Mr Ideal Nigeria. 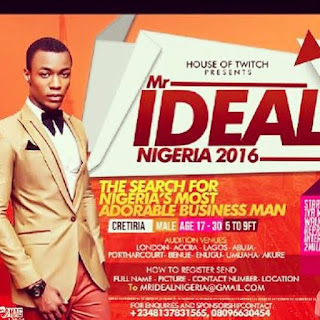 The House of Twitch presents the 7th Edition of the Mr Ideal Nigeria, the pageant that selects Nigeria's representatives to the MISTER AFRICA INTERNATIONAL , London 2016 (fastest growing male pageant in the world), Mr Model Africa and Mr United Nations. Aside representing the country in international pageants and fashion shows , the Mr Ideal Nigeria pride itself in Business start ups , the notable ones being Ayotunde Ajiboye , 2011 winner who owns the famous Whispers Restaurant in Surulere , Stanley Igwilo 2014 who owns the St Crown Fashion label and John Iwueke , 2015 who owns a perfume line. The new Mr Ideal Nigeria just like those before him , will start his own business and also become ambassador to the Lagos Start up Week (which airs on CNN) . He will also get a scholarship to a business school to sharpen his business skills. Being the most adorable man in Nigeria , the Mr Ideal Nigeria also lands an international modelling contract. Wale Bello 2010 winner is a multiple best male model award winner , and tops west Africa's list of most expensive models to hire. And we cant forget the Mr Ideal Nigeria's one year Nollywood contract , Abayomi Towase , 2012 winner is one of the stars of the Mnet's Calabash series. Emeka Darlignton , Mr Ideal Nigeria - Tourism 2015 (runner up ) has appeared on a number of hit tv shows and is also an airtel ambassador. He also gets a commercial contract with BERTS PRO , Eniola Towase , Mr Ideal Photogenic 2015/16 got signed and is the face of PEPSI COPA. 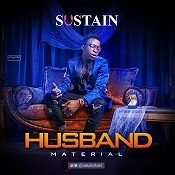 Other prices includes shoes and accessories for a year by T T Dalk , Wardrobe by Peerage Luxury, Suits by Morafa, watches by Watchlocker , covers the fitfam magazine , a year gym membership to keep his body in shape and prepare him for the international pageant, gifts from Michy okafor brand for his charitable visits. he also walks away with ambassadorial deals with Smooch energy Drink and American owned Skullcandy NG. Its not a case of winner takes all at the Mr ideal Nigeria , as the runner up will stand a chance to represent Nigeria at the Mister Earth and also win a year modelling contract. Special award winners for Top Model and Best body will represent the brand at the Gambia Fashion Week and land an endorsement deal with upper class Lotus fitness respectively. . Very simple steps to register , send NAME , PICTURE , LOCATION AND NUMBER to mridealnigeria@gmail.com. registration form costs N5000Ever heard of a male pageant that produces a winner with a unique combination of A fit body tone and an entrepreneurial mind ? Welcome to the world of the Mr Ideal Nigeria.